PAWTUCKET, R.I. -- The Red Wings launched four homers against rehabbing Boston starter Drew Pomeranz as they slugged their way to a 6-2 win Monday night at McCoy Stadium in Pawtucket. Rochester has now won 12 of their 19 games to even their record at 40-40 on the season. Byron Buxton got the homer parade started with a leadoff shot to DEEP left field. Three batters later, Kennys Vargasextended the Wings lead to 3-0 with a two-run shot - his team-leading 10th of the season. 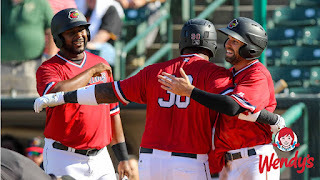 Edgar Corcino joined the fun in the second inning with a two-out solo shot - his first as a Red Wing this year - andLaMonte Wade finally bounced Pomeranz from the game with a long homer to right in the third inning that gave Rochester the 5-2 lead. The Wings last four homer game came May 25 vs. Buffalo. The last time the Wings homered five times in a game was nearly two years ago on July 28, 2016 at Pawtucket. Rochester entered the day 13th out of the 14 team International League in home runs hit and have now hit 35 of their 52 homers (67%) away from Frontier Field this year. DJ Baxendale made the spot start for Rochester after Zack Littell, the scheduled starter, was summoned up to Minnesota earlier in the day. Baxendale went 3.0 innings allowing two runs on three hits and a walk with three strikeouts. Luke Bard followed Baxendale and turned in three scoreless innings to earn the victory. Jake Reed and John Curtis combined to navigate the final three innings without yielding a run. The Wings are now 6-1 against the Paw Sox this season. Game two of this short two-game series in Pawtucket is Tuesday night. Righty Fernando Romero (1-1, 2.33) gets the start for the Red Wings. WINGS THINGS: Dating back to the beginning of 2017, the Wings have won 9 of their last 11 games at McCoy Stadium in Pawtucket…The leadoff homer for Buxton was his 7th in 77 games with the Red Wings…Prior to the game, Buxton was officially optioned to Rochester.